8 of 10: I loved a lot of the content of The Anti 9-to-5 Guide, although I certainly could have done without the occasional F words. I don’t have grand ambitions to start my own business, but I definitely have many projects that I want to get done and I have usually an hour or two in the afternoons after school and I’ll have several weeks between the end of the school year and the birth of our baby, and even for those small potato items, I found this book, recommended by Lisa, extremely useful. The first chapters, which focus on figuring out what your lifelong dreams and passions are, was really helpful and inspiring to me. Even not looking for a new career, I came up with a long list of projects and hobbies I want to pursue over the next months and years within just a few minutes. 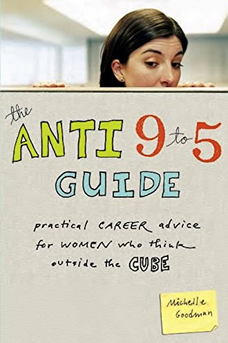 But really, what I appreciated about this book, was how specific and detailed it was about how to deal with the issues that come along with doing your own things – how to avoid wasting time, how to keep yourself motivated, and how to work it into a life with other responsibilities like children and spouses. It wasn’t a bunch of high-minded talk about how life is about pursuing your passions and then giving you no earthly idea on how to actually do that, but rather just making you irritated with your own situation. I find that completely unhelpful. Instead, each chapter ends with a list of things to do, a time period in which to do them, and an order in which to accomplish them. Nicely done, Goodman. Some of the chapters, of course, were pretty irrelevant to me (I’m not looking for a way to get paid to travel the world, nor do I want to start my own non-profit organization), but I kind of skimmed those ones and moved on with my life. I am very zen that way. If you were looking to leave a full-time job to pursue your own employment dreams, it’s got a very straight-forward guide to how to figure out how to do so – how much money you’ll need, health insurance, how to negotiate part-time or flex-time work, how to make the most of the opportunities a full-time job affords while you’re still there, etc – with step-by-step goals to achieve before you turn in your resignation. On the other hand, I was impressed by the chapter about full-time jobs and what a benefit they can be. Sometimes such books are so “if you work a full-time job, you’ve sold out to the man” and, as Bart could tell you, I am very much a fan of “the man” since he generally passes out health insurance, a 401(k), and a steady paycheck. The book is aimed specifically at women, but it would certainly be useful for men as well. I’ve already recommended this book to several friends and family members, either those looking to leave a full-time job or those working to launch their own businesses. Definitely worth reading if you’re in one of those categories or even if, like me, you just want a little motivation and instruction on getting your own projects done. Very interesting! I should see if my library has this one. So, I am not interested necessarily in starting a side business or anything. However, it would be nice to get some pointers as to how to accomplish some of my interests while also taking care of one's family. (Because, seriously….I really thought I would have more time to do stuff.) Do you think that this book would be helpful in addressing that? Or is it more geared towards the nuts and bolts of actual self-employment? Forgot to tell you…Ben got the book before I did. When I checked, I didn't have my library card handy, so I better go request it today before you've recommended it to more people in Provo and I have to wait longer! Sounds like an informative read – thanks! You might also enjoy a new one coming out by Lucy Rosen, called, "Fast Track Networking." I was able to get an early copy of the book and really got a lot out of it. The author has some great tips on how to properly network for business or a new job. I'm glad you liked it! After I was so glowing about it I didn't even finish it. I picked it back up a couple of days ago and remembered why I thought it was so helpful. I'm going to have to look for the one Audrey mentions as well, I think.